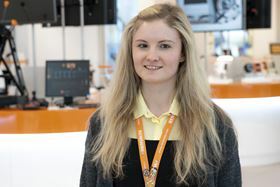 Emma Robertson, industrial design engineer at Renishaw. Emma Robertson, industrial design engineer at the company, took part in a workshop entitled Inspiring Women: the legacy of the First World War. Attendees learnt about the important contributions that women have made over the past 100 years and the event included a panel discussion featuring inspiring women working in a range of sectors. Robertson was nominated as an inspiring woman from the industry and STEM (science, technology, engineering and maths) category for her experience as an engineer and as a STEM ambassador at Renishaw. The IET is presenting a new exhibition in London, UK, celebrating women in science, technology, engineering and mathematics (STEM).